Sustainably grown, inspiration for your table. In addition to our farm's cherry and strawberry crops, in 2014 we added nearly two acres of vegetables and cut flowers. Our produce and flowers are sold at area farmers markets, through our Homestead Hill CSA, as well as to a variety of local restaurants, grocery stores, and schools. Many of our products can be purchased wholesale by grocery stores and restaurants through MI Farm Cooperative. Sustainably grown, fresh, quality produce. Our vegetables are grown using organic practices, and the 2+ acres where we grow them is currently in transition to "USDA Organic" certification. We do not use synthetic chemicals or fertilizers and practice minimal soil tillage. Inspiration. Want to cook like a rock star? Well, we can’t make any promises, but we do know the best chefs are known for sourcing the freshest produce available from their local community. Early availability. Season extension, including a hoop house, will help us provide some crops earlier than you could otherwise grow in your own garden! For example, we generally have tomatoes and cucumbers weeks ahead of those grown outdoors. Variety. The choice of crops we grow is designed to both appeal to your taste buds, but also outwit challenges provided by Mother Nature. We grow both heirlooms and our “tried and true” favorites! Choice. We respect that not everyone loves everything. Our weekly email newsletter will keep you informed of what’s coming in your box and give you an opportunity to either swap out 1-2 items for something you’d prefer - or make changes using a “swap box” during on farm pick up. Community. Meet other CSA members, farm staff, and tour the farm during one of our yet to be announced events (Spring Kick-off Open House, food demos, etc.). Events are announced in the email newsletter. 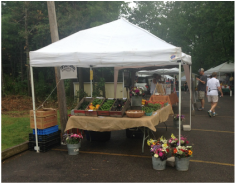 Traverse City Sara Hardy Downtown Farmers Market (7:30 AM - 12 Noon, Saturdays, June - October & Wednesdays during Strawberry season). 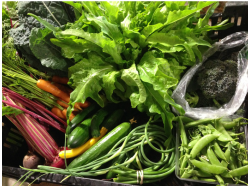 Consider becoming a Community Supported Agriculture (CSA) Member! Signing up for a CSA membership with our farm is a great way to commit your household to eating more fruits and vegetables. Just $31/week brings you FRESH, LOCAL GOODNESS that we hope will leave you looking forward to the next week! Our weekly newsletter lets you know what to expect in your box and provides an opportunity to swap out 1-2 items each week. 2019 will be our fifth season for Homestead Hill CSA! Review the options below, and sign up either ONLINE, or by downloading and submitting THIS FORM along with your deposit. Membership is limited and is first come-first serve until all shares are reserved. If you have any questions, please contact us! We are more than happy to answer questions! Tantalize your taste buds with the extra early green goodness from our hoophouse and field. Enjoy leafy greens, succulent radishes, micro-greens, and scallions followed by asparagus. Receive 3-4 items per week. Deciding between Regular and Small? An example of unit size for the Regular share is 10 oz of salad greens vs 5 oz for the Small share. Summer Garden Shares (early June thru September) This is the heart of what we do! Real food for you and your family. You’ll receive all the traditional garden staples, but with a sense of style and adventure beyond what you would find in the typical grocery cart! 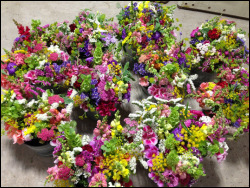 We plant over a hundred varieties, ranging from delectable heirlooms to our “tried and true” favorites. Expect to find tomatoes and cucumbers weeks ahead of in your backyard! We carefully pick, wash, and pack your weekly share of 6-10 items, based on what’s in season and ready for harvest. Grown using organic methods. Choose the option that fits you best! Available to those signing up for any vegetable or flower summer share. For six weeks, from mid-June to late July, receive either strawberries or cherries grown on the farm (depending on what is ripe). Conventionally grown, not organic. 8 Week Regular Fall Share The days may be cooler and the days shorter, but we will keep the harvest going for you! Shares contain a variety of crops ranging from hoophouse salad greens & herbs to storage crops like potatoes, onions, carrots, and winter squash. $249 (avg. $31/week). 8 Week Small Size Fall Share 50-60% of size of the Regular Fall Share. $154 (avg. $19/week). 1. What's the best way for me to get my share? *During Spring and Fall, all pick-up is from our farm on Thursdays. **Limitations apply. Available only during summer season in zip code ares 49653 and 49654 north of M-204. Businesses and workplaces interested in having a minimum of 5-10 shares delivered per week are invited to inquire with us directly. ***Market season only. (The 16 week CSA runs through end of September). 2. What size share should I sign up for? The Regular Size is our most popular, and is designed for a household of 2-4 people. A bag of salad greens is generally 10+ ounces, and a bunch of kale or chard would be around 1 lb. In comparison, a Small share works for 1-2 people who don't generally eat at home every night. A bag of salad greens would be closer to 5 oz and a bunch of kale or chard would be around 1/2 lb. If you are new, and can't decide, we suggest signing up for the Regular share, and you are welcome to adjust the size of your share (to change to small or large) within the first two weeks (we will arrange for refund or additional fee). To sign up, visit our Online Store, and use a credit card, OR Click here to download and print your copy of the CSA Sign Up Form. Click HERE for Job Opportunties!